Terra Mater Film Studios is proud to announce the international premiere of our production ‘The Ivory Game’. 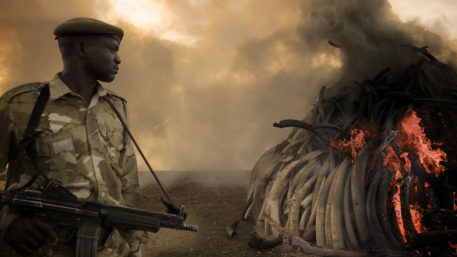 We come to Telluride and Toronto International Film Festival this year with ‘The Ivory Game’, a powerful and timely documentary, which will receive its International Premiere on September 10th, as part of the festival’s TIFF Docs section. ‘The Ivory Game’ is an epic documentary feature that goes undercover into the dark and sinister underbelly of ivory trafficking. Award-winning director Richard Ladkani and Academy Award®–nominated director Kief Davidson filmed undercover for 16 months with a crack team of intelligence operatives, undercover activists, passionate frontline rangers and tough-as-nails conservationists, to infiltrate the corrupt global network of ivory trafficking. The production from Terra Mater Film Studios, Vulcan Productions and executive-producer Leonardo DiCaprio follows poachers in pursuit of the ‘white gold’ of ivory, as time is running out for the African elephants, now dangerously close to extinction. Netflix has obtained worldwide distribution rights to the project and is set to launch the film globally to their 81 million subscribers on November 4th 2016.